WordPress SEO Theme Talian 5.5 with optional AdSense ads has been tested on WordPress 3.9 and no major issues found. Talian 5.5 was updated to WordPress 3.9 compatible April 2014 and is now free. 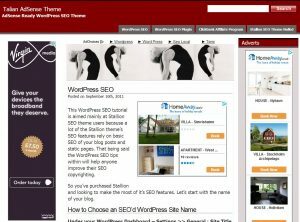 Talian 5 used to be the best WordPress SEO theme available, I offered a guarantee if someone could find a better SEO’d theme I’d pay them $500 by PayPal. 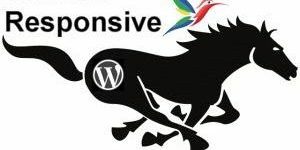 That offer is no longer available since I’ve since created the Stallion Responsive theme which is THE best WordPress SEO theme available ($5,000 if you can find a better SEO’d theme). For a free SEO theme Talian 5.5 is a good first step into using WordPress SEO themes, but it doesn’t come close to Stallion Responsive SEO (~5 years additional development time). I’m now considering Talian 5.5 an AdSense theme even though SEO wise it’s still better than 99% of premium WordPress themes. New admin menu (screenshot below, click for large version) for Talian 5.5, no more editing theme files to add your Google AdSense Code. All major settings are available directly through the WordPress Dashboard. 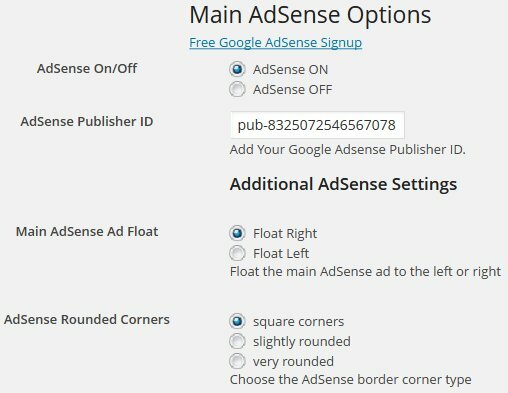 Add AdSense ads to your blog. Talian 5 is AdSense ready, you can even set Google AdSense Channels for tracking the performance of specific ads without template file editing. Add up to 6 Google AdSense channels via the new Talian admin page (one for each of the 6 ad units available) and track which AdSense setup works best for your sites. Set the colour of both the AdSense ads directly from your WordPress Dashboard. Don’t like the ads floating to the right of the main content, float them to the left instead. Just want to use Talian 5 as an SEO WordPress theme or even SEO CMS, a few clicks on the Talian 5 admin menu and NO AdSense ads will show and you can even remove the date when a post was made (so your site doesn’t look like a blog). Don’t like the default banner images, no problems, choose from 10 banner sets (100 banner images in total) or why not create your own and choose them from the Talian 5 admin screen. Banners don’t really work for your site, turn them off completely with two clicks of the mouse. Above is just a sample of the new options available with the built in admin panel. Search Engine Optimized Code (one of the best WordPress SEO themes). Built in AdSense ads with easy to use options (no editing multiple theme files) : one click to turn on/off. Multiple banner schemes with easy to use customization. Ability to change comments into search engine indexable ‘blog like posts’ using a customized version of the SEO Super Comments plugin (only works with Talian 5). Custom widget template file: add your own widgets (sidebar menu items) without touching the functions.php file making it easier to customise your site without the hassle of lots of code work when a new update is released. Two sitemap options, basic sitemap listing blog posts and blog pages and an advanced sitemap with the above plus links to the latest 100 comments (used on this site in the top navigation menu). Navigation menu looking messy, turn it off completely. Turn the ability of your commenter’s to add an author link on/off and turn current author links on/off. Turn the date you made a post on or off, particularly useful if you use WordPress as an SEO CMS (content management system) rather than a blog. The screenshot shows a home page of a Talian 05 theme running site. You can see the three Google AdSense ad units in the screenshot, the center ad unit is the ad unit that floats to the right (or left, change via the admin menu) at the top of the content of the first post only. You can also see the sidebar AdSense widget that can be placed anywhere on the two sidebars (I find the top left works best for this AdSense ad unit). Through rigorous testing I’ve found Talian to be one of the best AdSense theme from a CTR (click through rate) perspective, with a CTR on some sites above 6%. Talian was the ONLY WordPress theme I used on my own WordPress websites until creating Stallion Responsive, it’s that good (I had over 70 WordPress installations running Talian 5). I’ve looked at many other WordPress themes that include AdSense and other than a copy cat (someone copied the code of an earlier version of one of my themes) no one used this technique of floating an Ad unit within the content of the first post of archive pages (home page, category, tag and search pages) when I first released the Talian AdSense theme (plenty of copy cats in 2014). This location is one of the most clicked areas (AdSense hot zone), by utilizing this location this ad unit almost always performs well. You will find the same ad units and placement for all pages of the blog, which will maximize AdSense revenue. Further down the page (not on the screenshot) is the third and final ad unit, out the box the Talian 05 AdSense ad unit is set at 468×60, the size of all ad units can be changed manually via the adsense.php file in a text editor, so changing the size doesn’t need a PHP programmer or anything :-). 1. Unzip the Talian WP Theme zip file. 2. Upload the entire /talian-theme/ folder to your WordPress themes directory (via FTP, just like any other WP theme you’ve used). 2. Log into your blogs dashboard and under “Appearance” >> “Themes” select the new “Talian AdSense Theme” . 4. Copy your Google AdSense Publisher ID into the “AdSense Publisher ID” box and click the “Store Options” button. Your WordPress blog is now running Talian 5 and any AdSense clicks will be credited to your AdSense account. All other options are optional. The Talian AdSense SEO theme out the box uses blended ad unit colours for maximum CTR/AdSense revenue. If you wish to change unit colours it’s very easy to achieve via the Talian 5 menu. 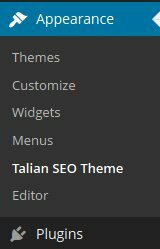 There are full instructions for using the Talian 5 SEO theme to it’s full potential within the folder /talian-theme/readme/. Most WordPress themes aren’t too bad SEO wise when downloaded directly from their original creators, but there are always improvements that can be made for maximum SEO impact and this theme was no different. Optimized title elements (and meta tags, though they aren’t very important these days). Take a look at the title of this page, note it’s keyword rich and lacks the name of the site (for SEO reasons). Optimized headers, for example on blog post pages like this one the name of the blog is NOT within a H1 header, (every theme I’ve used has a H1 header that holds a link to home page). Instead the title of the post is within the H1 header and the link to home is only a H1 header on pages that lack a true keyword focus like the monthly archive pages. This is the first WordPress theme that I thought to do this and it results in significant SEO improvements. Optimized anchor text of almost all automatically generated links. Links to unimportant pages (from an SEO perspective) like the log in links (those links waste a LOT of PR/link benefit) are no longer wasting link benefit. Basically optimized everything I could which made this the most optimized WordPress theme I’d created at the time. I’m not sure why, but I’m having a problem getting my aweber autoresponder/email submitter code to fit in the text widget box on the right side of my Talian Theme. I used the widget to make a box for my Newsletter Sign-Up and it shows up outside the box. I’m sure I’m doing something wrong, could you please help? Thank you for your nice theme, but i do not know why menus give errors that they goes down from the left sidebar, also menus letter can’t readable, how i can change the menu characters and options? Probably not enough details to determine what’s wrong. When others had issues with the Talian 5 theme menu it was either they had too many static Pages added to their menu or broken HTML code in a post. There’s a lot of Talian 5 (the older premium WordPress theme I used to sell) users that used Talian 5 on autoblogs and they are prone to HTML errors. As an autoblog plugin scrapes content from various sources some of the content includes broken PHP code and it can break a WordPress sites layout. Since Talian 5 has an advanced CSS SEO layout it is more prone to being broken by these HTML code errors added to posts. This would break the theme layout. They would find if they viewed multiple parts o the autoblog site some pages would be fine (they didn’t have the extra broken HTML code) and some pages broke.